Rewards Canada: Air Canada Earn Your Wings The Amazing Race Canada Edition is now on! Air Canada Earn Your Wings The Amazing Race Canada Edition is now on! 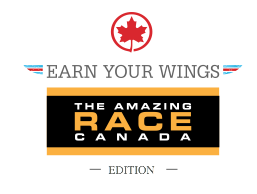 It took a bit of time but Air Canada officially launched the "Earn Your Wings - The Amazing Race Canada Edition" promotion late yesterday. We already brought you the details last week on the promotion but here it is once again as now we know the value and requirements of the majority of the badges. For flights to count they must be booked between yesterday and November 17th completed by December 15th. For complete details and to register for the promotion click here. Some of the badges are easy to earn, hopefully you pre-registered as mentioned in our earlier post for "The Early Bird Badge" for 500 RaceWings, if not don't worry you will get the "Participant Badge" worth 250 RaceWings when you register. You can also earn a couple of badges and more RaceWings by sharing the promotion via social media, see the bottom of the badge legend below for the details. The only other non-flying badge is the "Savvy Traveler" badge for Fairmont stays/Avis Car Rentals. Other than that it is all about the flying! Earn RaceWings and fly to the top of the leaderboard (RaceWings will help you keep score). To start you off, we’ll give you 250 RaceWings just for registering. Earn 200 RaceWings with each take-off and landing on Air Canada, Air Canada Express and Air Canada rouge. To earn more RaceWings, you’ll need to touch down and take-off from select airports around the world called Pit Stops. You receive badges for completing certain challenges, tasks and specific activities. Each time you earn a badge, you also earn RaceWings. To earn these badges, you’ll have to be in the know because some of them are only available for a limited time. Just like The Amazing Race Canada, there will be surprise challenges throughout the game. Rise to the challenge and we’ll reward you with even more RaceWings! Get ahead of the game. Take off or land at a Pit Stop city in a Latitude or Premium Economy fare to earn 500 bonus RaceWings and this badge. This challenge is on-going and the badge can be earned more than once. Get further ahead of the game! Take off or land at a Pit Stop city in an Executive Class or Executive First fare to earn 1,000 bonus RaceWings, as well as this badge. To collect this badge, you’ll have to be a high roller. Every time you hit 100,000 RaceWings we’ll give you 100,000 bonus Aeroplan Miles. That’s 200,000 bonus Aeroplan miles for every 100,000 RaceWings! The Detour badge details and its bonus RaceWings value will be revealed during the promotion period. Keep your eyes open and check your emails! The Speedbump badge details and its bonus RaceWings value will be revealed during the promotion period. Keep your eyes open and check your emails! The U-Turn badge details and its bonus RaceWings value will be revealed during the promotion period. Keep your eyes open and check your emails! You’ll need to do some planning to earn these badges! A task badge is awarded once you have completed a combination of specific airports. There is no limit to how many times you can earn these badges. Collect this badge when you take off all three of these, which are known for their timepieces: London (LHR), Geneva (GVA) and Zurich (ZRH). New York City (LGA), San Francisco (SFO), Pittsburgh (PIT) are all known for their bridges. Take off or land at all three of these airports to collect this badge. To collect this badge, follow in the footsteps of The Amazing Race Canada contestants. Take off or land in Halifax (YHZ), Regina (YQR), Toronto Island (YTZ) and St. John’s (YYT). You’ll have to drive on the left when you visit London (LHR), Tokyo (NRT) and Hong Kong (HKG). Collect this badge when you take off or land in all three of these destinations. Collect this badge when you take off or land in all four destinations on the East Coast of the United States that have been featured in the American version of The Amazing Race: New York City (LGA and EWR), Boston (BOS), Philadelphia (PHL). Collect this badge when you take off or land in all six of these western U.S. cities, all featured in the American version of The Amazing Race: Los Angeles (LAX), San Francisco (SFO), Dallas (DFW), Seattle (SEA), Phoenix (PHX), Denver (DEN). Collect this badge when you take off or land in the following destinations The Amazing Race Canada contestants call home: Ottawa (YOW), Toronto (YTZ), Winnipeg (YWG) and Edmonton (YEG). You might be surprised to learn that Copenhagen (CPH), Istanbul (IST) and Seoul (ICN) all have famous towers. Discover them for yourself when you take off and land in all three destination and collect this badge. Collect this badge when you take off or land in these three cities, which built a reputation for their car manufacturing industries: Detroit (DTW), Frankfurt (FRA) and Tokyo (NRT). Toronto (YTZ), Thunder Bay (YQT), Cleveland (CLE), Milwaukee (MKE) all border one of the Great Lakes. Collect this badge when you take off or land in all four. In this traditional Chinese dance, performers mimic a lion’s movement dressed up as the king of the jungle. Touch down in these four destinations where the dance is practiced to collect the badge: Tokyo (NRT), Beijing (PEK), Shanghai (PVG) and Hong Kong (HKG). Did you know Dallas (DFW) is known for its fine Mexican food? Take off and/or landing in both Dallas and Mexico City (MEX) to collect this badge, which celebrates the delicious cuisine. Collect this badge when you take off or land in these three cities with major aircraft manufacturing industries: Seattle (SEA), Paris (CDG) and London (LHR). Touch down in beautiful British Columbia to collect this badge. You must take off and/or land in all of the following destinations: Fort St. John (YXJ), Kamloops (YKA), Prince George (YXS), Terrace (YXT), Victoria (YYJ) and Nanaimo (YCD). You’d better carry UV protection when visiting Mexico City (MEX), Grand Cayman (GCM) and Point-à-Pitre, Guadeloupe (PTP). Take off and/or land in all three to collect this badge. To collect this badge, take off or land in all six of these cities, all home to provincial sports hall of fame museums: Toronto (YTZ), Winnipeg (YWG), Saskatoon (YXE), Regina (YQR), Red Deer (YQF) and Prince George (YXS). Collect this badge when you take off and land in all of the following destinations with First Nation monikers: Ottawa (YOW), Winnipeg (YWG), Saskatoon (YXE) and Kamloops (YKA). Air Canada operates turboprop planes in Saskatoon (YXE), Regina (YQG), Edmonton (YEG), Fort St. John (YXJ), Victoria (YYJ) and Nanaimo (YCD). Take off or land in all six of these destinations to collect this badge. Bonjour, cheerio, guten Tag, hej! Take off or land in London (LHR), Paris (CDG), Frankfurt (FRA), Brussels (BRU) and Copenhagen (CPH) to collect this badge. Don’t forget to say hello! All of the following destinations have a connection to Lady Liberty: New York City (EWR), Paris (CDG) and Tokyo (NRT). Take off or land in all three to collect this badge. For a taste of top-notch seafood, head to all of three destinations and collect this badge: Halifax (YHZ), St. John’s (YYT), San Francisco (SFO) and Seattle (SEA). To collect this badge, you’ll need to take off or land in all of three of these destinations, which follow the pacific coast: Los Angeles (LAX), San Francisco (SFO) and Seattle (SEA). Travel coast to coast to collect this badge. All of the following destinations are on the Trans-Canada Highway, which winds its way through all the country: Ottawa (YOW), Winnipeg (YWG), Saskatoon (YXE), Regina (YQR), Edmonton (YEG), St. John’s (YYT), Thunder Bay (YQT), Kamloops (YKA), Victoria (YYJ) and Nanaimo (YCD). Take off or land in all ten of these destinations to collect this badge. A good cuppa is always appreciated in London (LHR), Beijing (PEK), Shanghai (PVG) and Hong Kong (HKG). Take off or land in all four to collect this badge. Awarded every time you take off or land at specific airports. Each airport has its own badge and is equal to a certain number of RaceWings. There is no limit to how many times you can earn these badges. Awarded when you complete a combination of three activities with Air Canada partners Fairmont Hotels & Resorts or Avis. For instance, you’ll earn this badge if you book two car rentals with Avis and one stay at a Fairmont Hotel. There is no limit to how many times you can earn this badge. 250 RaceWings. You must enter your Aeroplan number when booking these activities in order for them to qualify for this badge and for the bonus RaceWings. Register for this promotion before September 24, 2013 to collect this badge and earn 500 RaceWings. To thank you for registering within the promotion period, we’ll start you off with this badge and 250 RaceWings. Let your friends know where you rank on the Leaderboard and share the game on Facebook and Twitter, to earn more RaceWings. Share it once and you’ll earn 100 bonus RaceWings. Share ten times and collect the Level 1 Social badge along with 500 bonus RaceWings. Share at least twenty times for 1000 bonus RaceWings and a Level 2 Social badge.